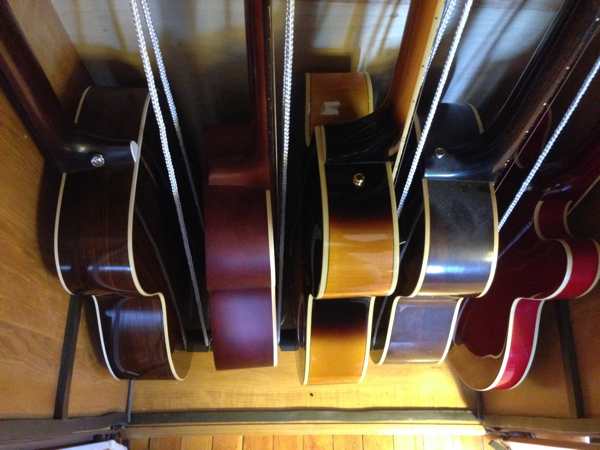 Almost all experts (including luthiers, music educators, guitarists, music store staff, etc.) recommend that you keep your guitar in its case when you’re not playing it. This is especially emphasized if you live where the humidity is low at least part of the year. 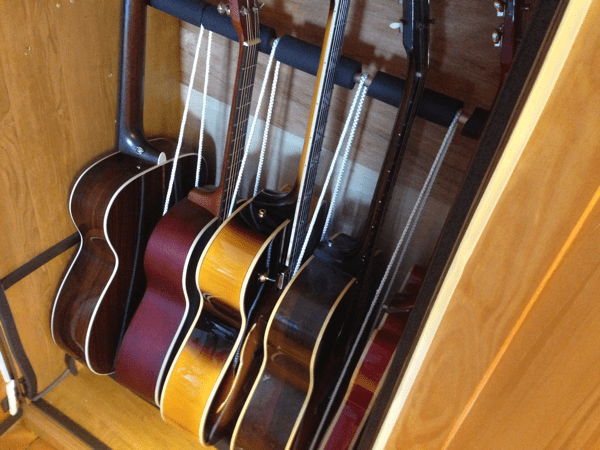 Use guitar case humidifiers to protect your instrument. But have you ever seen those fancy guitar display cabinets and thought, that would be really nice. Some of these display cases have built in humidification systems. Those guitar display and storage cabinets are fine furniture made by skilled, proud craftsmen. This is reflected in the prices for these cases. The low end is about $2000. The high end is your imagination since most of the builders will customize to your specifications. I can’t afford those cabinets. Here’s the story of the humidified guitar cabinet I’ve been using for about 10 years. I just completed some upgrades to it and have pictures to illustrate what I’ve done. First, why not follow all those experts advice and keep our guitars in their cases where we’re told they belong. I’ve done that and for a few guitars continue to keep them in their case. I agree it’s a good idea. The practical reason I prefer to keep them in a cabinet during the dry winter months is accessibility and convenience. If you have a lot of guitars it can be a lot of work to keep your guitar case humidifiers charged with water. But with a humidified cabinet I just need to do a single check to see if my humidifier needs water, and single fill if it does. That takes care of five guitars. When it comes time to play a guitar it takes considerably more time removing a guitar from its case than from the cabinet. The cabinet I use is not a display cabinet. The cabinet is for protection, humidification and convenience. This cabinet started life as an inexpensive piece of knock-down furniture. It was an armoire but originally purchased and repurposed to serve as a locked cabinet for office supplies when my wife’s business still leased a full time offsite office. The cabinet was brought home after we decided that 95% of what we did could be done at our home office. Eventually my wife decided it was cheap and ugly and that we should put it out with the trash. As I helped my wife move this item toward the front door I realized my guitars would fit in the cabinet with only some minor modifications. Instead of putting the cabinet on the curb in front of our home, we moved it to my study where it has lived ever since. There were (and are) some major problems converting the use of the cabinet to a humidified guitar cabinet. The first challenge was a middle shelf. The cabinet had come with adjustable shelves (now removed) except for one shelf in the middle of the cabinet. That shelf had a structural role in holding the shape of the cabinet. The shelf was in the way of my guitar but couldn’t be removed without having the cabinet fall over (maybe an exaggeration – but ??). 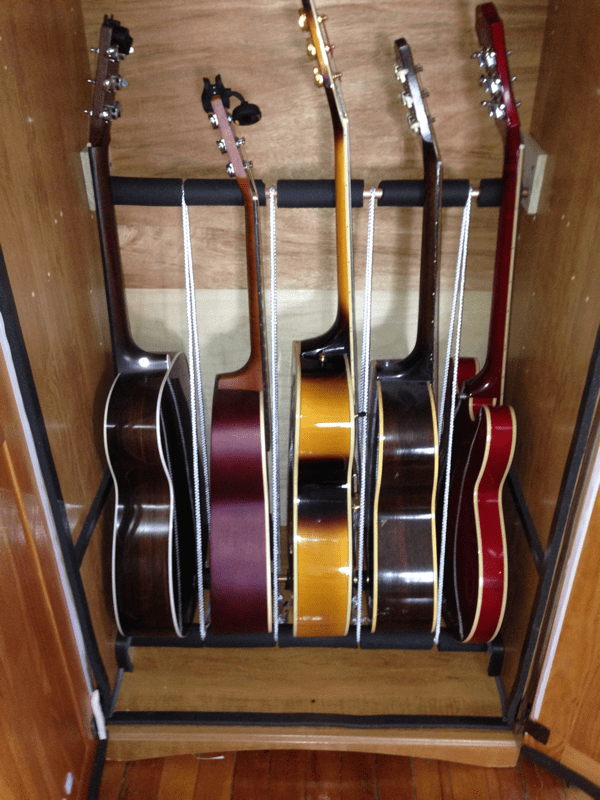 My solution was to move the shelf to a higher location (probably not as optimal from a structural standpoint) that allowed my guitars to fit into the lower portion of the cabinet and provided storage above the guitars. 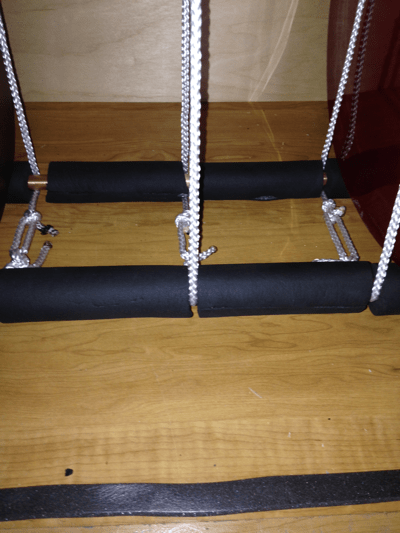 I re-attached the shelf so it still was non-adjustable and still provided some structural stability. The next problem was sealing the cabinet. The armoire was not designed to be airtight. However, in order to maintain the inside of the cabinet at a higher humidity than my study in the winter the cabinet had to be fairly well sealed. That was and continues to be a difficult problem to overcome. The major area of concern is the doors to the armoire / cabinet. I’ve used a variety of weather stripping products for doors and windows to reduce the leakage of humidified air in the cabinet. But to be honest, it is still leaky. I use an indoor / outdoor digital thermometer / hygrometer with a wireless remote to monitor the humidity in the case. The “outdoor” remote goes in the cabinet near the bodies of the guitars. This way I can check on the temperature and humidity in the cabinet without opening it. Every time I go by the cabinet in the winter I give a quick glance to see if everything is still OK. The main display saves the min-max readings since the last time they were reset. That helps my confidence that the humidity in the case hasn’t dropped too low during the night. My humidification system is unsophisticated. Although I’ve thought about using a sponge activated with a saturated solution of potassium carbonate, the system I am using has worked for 10 years. Potassium carbonate solutions provide a constant humidity of about 43% in a closed system – which mine isn’t. I originally tried using guitar case humidifiers but the cabinet is too big and too leaky for multiple guitar case humidifiers to keep the interior humidified. What I have is a plastic container with a large sponge. I saturate the sponge but don’t add excess water. The object of the sponge is to prevent a situation where I might accidentally spill water on my guitars. The plastic container with soaked sponge is placed on the top shelf of the cabinet. The shelf isn’t the full depth of the cabinet so the humidity is freely circulated throughout. When the humidity is just slightly lower than optimal, this is often sufficient to protect my guitars. However, as the humidity approaches 20% RH I turn on a small fan that blows over the top of the plastic container and sponge. This works fairly well except in the driest of conditions. When it is really dry, a room humidifier that is next to the cabinet is generally enough to keep the humidity in the cabinet under control. The humidifier creates a local concentration of higher humidity. This probably wouldn’t be necessary if I could seal all the leaks in the cabinet. However, the important observation is that over 10 years of use and monitoring, this system has done a good (but not perfect) job of controlling the humidity for my guitars. The improvements I just completed on the cabinet concern the support system I use to position the guitars in the cabinet. I cut two lengths of 1/2 inch copper water pipe as the bottom supports for the guitars and a third length for the necks of the guitars. I used water pipe in part because I could buy rubber pipe insulation to fit the pipes. That serves as the cushion for the guitars so they aren’t sitting directly on copper pipe. I could have used plastic pipe but I already had the copper pipe from previous home improvement projects. I did have 1/2 inch plastic pipe but found that it is too thin and not rigid enough to support the guitars. 1 inch plastic pipe would have worked although a larger size of rubber or foam insulation would be needed. If you plan to adapt this idea to your own need you should experiment with where to place the pipes. I have the bottom front pipe slightly higher than the bottom rear. The reason for this is too insure the guitars don’t fall forward, out of the cabinet, even if they are not quite properly placed. The rear bottom pipe center is about 7 inches from the rear of the cabinet and the front is about 13.5 inches from the rear. 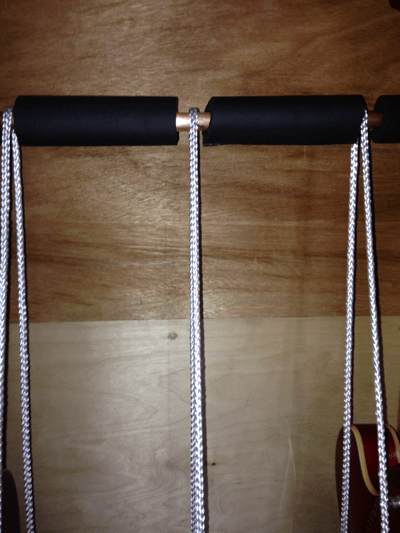 The pipes are held in place by small pieces of wood attached to the sides and with 5/8″ holes for the pipe. I had previously used a 2×4 piece of wood with dowel rods projecting out to support the necks of the guitars and keep the guitars apart. However I was always afraid I would accidentally bang one guitar against the next when putting a guitar away. My new system uses 1/4 inch braided nylon cord wrapped around all three copper pipes to visually show me where each guitar goes and to serve as slight protection if I misjudge what I’m doing. The nylon cord keeps the guitars from falling over. The cord buffer for each guitar is tied between the bottom pipes to keep it out of the way. Each rubber insulation section used for padding is about 5 to 5 1/2 inches long. I found that works for most of my acoustic guitars. The guitar on the right, my Epiphone casino has a shorter section. Great idea. I like the use of the braided cord. Really smart. I might do something similar. Have you tried sealing all the joints with silicone? I’ve sealed the inside joints with silicone. The problem area is door hinge area. I’ve used foam weather stripping along the top, bottom and hinge areas and that helps but it doesn’t seal it completely. If I were to remake the cabinet (or next upgrade) I wouldn’t cut separate foam sections from pipe insulation and instead wrap the braided cord directly around one long length of pipe insulation. I also go back and forth as to whether my original design for keeping the guitars upright and apart was better than this. The original design used doll rods in a 2×4 to keep the necks upright. However, I do like the visual cue the cord provides me when I remove or store a guitar. Thanks for sharing your experience with your guitar cabinet projects. I’ve been looking for an old piece of furniture with a glass door but haven’t found anything appropriate. I like the idea of the LED lights. Although I’ve never tried anything with a humidistat, for a while I had an outlet with a temperature sensor to control the temperature by turning on/off an incandescent light bulb as the source of heat. I don’t use that anymore but the concept is similar to the humidistat. Somebody, please make a kit we guitars players in dry climates can put together! you should use a magnetic strip to seal the doors. like a refrigerator. Seems like a good suggestion. Thanks. Liked your ideas. I am looking into building a cabinet for my guitars. I live in Denver and man is the humidity low here in the winter. If you could seal your cabinet, would you use potassium carbonate and if so, is it available and how does the system work? The reason I ask is I saw the expensive cabinets I could buy on line use a humidity control system that raises or lowers the humidity similar to the D’Addario humidity devices I use in my cases. Problem with those is they dry out in about a month here without using a D’Addario sponge case to support them and I hate putting anything wet inside my guitar. Couldn’t locate any systems to control humidity on line (only puled up industrial systems) so I wondered if I could incorporate the potassium carbonate system into my case. I’ve used saturated salt solutions, including potassium carbonate, to control humidity when I was still a working scientist. I’ve never actually tried to use potassium carbonate in my guitar cabinet. The principal of saturated salt solutions has used by museums to control the humidity of precious items in glass display cases. One of the problems I read about when researching this was the salt solution could creep up and over the walls of the container that held it. This would not be good if it could do this and get on your guitars. Commercial humidity systems such as the D’Addario contain the salt solution in packages that only allows the humidity (gas) to come and go, not liquid. Another approach is to not have any free liquid but instead use a wetted sponge. Please understand, I’ve avoided using homemade salt based humidity controls with my guitars. I’ve used just water, sponges and fan. I am currently using the D’Addario system in my guitar cases. I had to leave my guitar cabinet behind when I moved to NC from MA. A simplified explanation of how a saturated salt solution controls humidity is that when the humidity is too high the undissolved salts absorb moisture from the air and reduce the amount of crystalline salt in the liquid — but the concentration of dissolved salt remains the same (saturated). When it is too dry, liquid is evaporated into the air thus increasing the humidity. The the amount of crystalline salt in the liquid increases. Again, the concentration of the dissolved salt remains the same. It is still a saturated solution, meaning it is the highest concentration of salt that can be dissolved. If you intend to try this, I’ve found potassium carbonate among beer brewing supplies online. Try Amazon.com if you can’t find it anywhere else. Hope this helps and good luck. I wish I still had my guitar cabinet. I could use one right now. However, I expect I won’t need one as much in North Carolina as I did in New England.